At the end of the first period of Tuesday night’s game, the Nashville Predators were outshooting the Arizona Coyotes 16-13, but found themselves down 1-0. It was a familiar script for a team that has mystifyingly struggled against the Coyotes this season. In the Predators’ first two meetings with the Coyotes, they outshot Arizona yet lost both games. However, this time they flipped the script, and the shot advantage turned into an advantage on the score line, and the Predators earned their first win of the season over Arizona by a final score of 5-2. The Predators outshot the Coyotes 47-26, and thanks to an inspired effort in the second period, were able to secure the victory as well. In their first matchup on November 15, the Predators dominated all phases of the game, putting up 45 shots on Coyotes goalie Darcy Kuemper. But, a shorthanded goal in the first period and a follow-up goal by Jason Demers in the second period were all the Coyotes needed to overcome the possession difference and take a 2-1 win. Later that month, the Predators outshot the Coyotes 29-25, but Arizona was able to capitalize on their chances and earn a 3-0 victory. It was also the first shutout of goalie Adin Hill’s career. This time around, the Predators faced Calvin Pickard in goal, and couldn’t find a way to solve him in the first period. As a result, one costly mistake in the defensive zone put the Coyotes in front. Just when the curse of the Coyotes looked to continue for Nashville, the team rallied and put together an explosive three-goal effort in the second period. Craig Smith scored the first early in the period, and Filip Forsberg added a power play goal minutes later. Ellis moved forward and crashed the net to score later in the period to make it 3-1 in favor of the home team. The Coyotes are a young team that is coming off of a tough loss on Monday night against the Dallas Stars, so they were already at a disadvantage going into the game. However, Arizona didn’t quit and cut the Predators’ lead in half in the third period. That toughness is what makes them a stingy team to play against no matter the possession or shot stats. 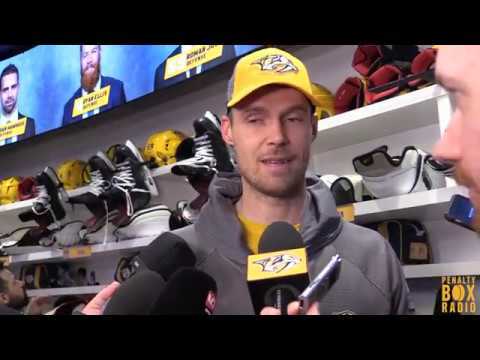 With a solid win against a hungry playoff bubble team, the Predators hope to string together two consecutive home wins for the first time since mid-December when they take on the division rival Dallas Stars on Thursday night. They will also be looking to avenge last Saturday’s tough loss to the Stars at Bridgestone Arena.